Amnesty’s biased evidentiary approach is also manifest in Families under the Rubble, which examines targeted Israeli attacks on inhabited civilian homes. 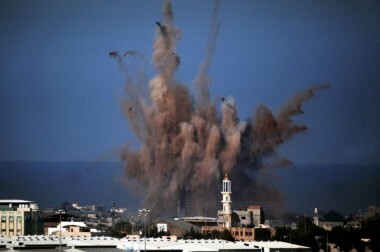 It does find that the eight attacks on which it focused were on various grounds unlawful and possibly war crimes.In particular, “the loss of civilian lives, injury to civilians and damage to civilian objects appear disproportionate, that is, out of proportion to the likely military advantage of carrying out the attack.” However, although it asserts that “the onus is on Israel to provide information concerning the attacks and their intended targets,” and although Israel itself “made no statement about who or what was being targeted, or even acknowledged that it carried out these particular attacks, ” Amnesty bizarrely takes upon itself the task of ferreting out legitimate Israeli pretexts for each murderous assault. It repeatedly speculates, often on the flimsiest of grounds, that Israel targeted this or that civilian dwelling because a Hamas militant might have been hiding inside (see Table 3). One of the neighbors said that he had heard from others that a group of unknown people were walking around in the corridor somewhere downstairs on the night of the attack. Some neighbors speculated, without seeing them, that they might have been members of an armed group…. It is unclear what the intended target of this attack was. Even if a group of men had entered the building and were assumed or known to have been members of an armed group by the military, its actions of targeting two family apartments was reckless and disproportionate. The apparent target of Israel’s attacks was Ahmed Sahmoud, a member of the al-Qassam Brigades, Hamas’ armed wing. According to Israeli sources he was a high-ranking officer in the Khan Yunis command. Early reports of the attack said that he was inside the building visiting a member of the Abu Jame’ family. Surviving family members and neighbors denied this…. [N]eighbors believed that Ahmed Sahmoud might have been under the balcony of his mother’s apartment on the ground floor when the house was attacked…. If Ahmed Sahmoud was the intended target this would constitute a grossly disproportionate attack. By questioning many of the family members and their neighbors an Amnesty International fieldworker found three residents who might have been the object of an attack. [Four long paragraphs follow filled with inconclusive speculations on them.] Even if all the three men who might have been targets had been directly participating in hostilities, their presence in the house would not have deprived the other residents of their immunity, as civilians, from direct attack…. The effects of an attack…should have been…regarded as manifestly disproportionate. [T]wo neighbors maintained that, following the attack, they found out that at least four members of the al-Qassem Brigades, the armed wing of Hamas, including a battalion commander and a communications officer, were apparently using the empty apartment in the building for some time prior to the attack…. Amnesty International has been unable to verify this information. However, even if the empty flat in the…building was used by the al-Qassam Brigades, the loss of civilian life in this attack was clearly disproportionate. Neighbors told Amnesty International’s fieldworker that they believed that the attack was intended to target the home of the man who went by the name of “Abu Amra,” who was not in his apartment at the time…. Amnesty International has been unable to confirm the identity of “Abu Amra” nor [sic] whether or not he did have any relationship with any armed group. Even if “Abu Amra” was a fighter or otherwise had been directly participating in hostilities, this attack was carried out in a manner that violated international humanitarian law. Although family members denied it, both Ramadan Kamal al-Bakri and Ibrahim al-Mashharawi [two of the deceased] were members of Islamic Jihad’s al-Quds Brigades…. [If these two men] were the intended targets,…the Israeli forces should have taken necessary precautions to minimize the risk to civilians in the house.Notwithstanding Amnesty’s intrepid sleuthing, 2014 Gaza Conflict (published after Amnesty’s report) points to “Omar Al-Rahim, a senior commander in Palestinian Islamic Jihad” as the actual target of this attack (paras. 267, 456). All witnesses who gave statements said that none of the family members was involved with armed groups…. [The brother of the deceased head of household] said: “Earlier Ra’fat had gone out with a torch to investigate a rocket that he thought had gone up from the olive fields east of our house.… They probably thought that Ra’fat had shot the rocket from the field and thought he was from the resistance.”… Even if they believed that a fighter was present, Israeli forces should have realized that bombing the house would be a disproportionate attack. The intended target of the attack appears to have been Hayel Abu Dahrouj, a member of Islamic Jihad’s al-Quds Brigades, who had returned to his house shortly before the attack. “He missed his kids so he came back to the house,” his brother Wael told Amnesty International’s fieldworker.… If Hayel Abu Dahrouj was the intended target, it is unclear why Israeli forces did not take necessary precautions to minimize the risk to civilians in the homes. Setting aside that, in most of these instances, it’s unclear how Israel would even have known of the militant’s presence before attacking (most neighbors seemed to be in the dark);On another incongruous note, Amnesty repeatedly faults Israel for not issuing warnings before its attacks. But if the target was a Hamas militant, wouldn’t it have defeated the purpose to alert him in advance? and setting aside that, by supplying Israel with alibis for among the most heinous atrocities it committed during OPE, Amnesty conveniently relieved the burdens of Israeli hasbara;The nebulous, subjective and relative charge of a “disproportionate” attack is much easier to rebut than the charge of an indiscriminate or intentional attack on civilians/civilian objects. 2014 Gaza Conflict repeatedly invokes the numberless caveats attached to the proportionality principle, in effect demonstrating the near impossibility of convicting anyone on its basis (paras. 49, 317-33, 401-2, 452, 456, Annex, paras. 6-8). On a related note, when Hamas fires mortar shells in a populated area, Amnesty accuses it of the non-rebuttable charge of an “indiscriminate” attack, whereas when Israel drops a 2,000 pound bomb and fires artillery shells in a densely populated area, killing large numbers of civilians, Amnesty accuses it of committing a “disproportionate” attack—an allegation that Israel is then invited to rebut (“The onus is on Israel to provide information relating to why it targeted…”). See Families under the Rubble, Al-Dali Building, Al-Louh Family Home. and setting aside that even Israel’s harshest critic would concede an occasional operational error, making Amnesty’s detection in every instance of the Hamas militant targeted by Israel yet more embarrassingly apologetic—setting all this aside, wittingly or unwittingly the net effect of Amnesty’s report is to convey the distinct impression that Israel was overwhelmingly targeting Hamas militants in its attacks on civilian homes. In fact, in a sober calculation of its pedagogical value, but also in a state of inflamed madness, Israel inflicted a grotesque form of collective punishment, as it indiscriminately or intentionally leveled a staggering number of Gazan homes, initially targeting the hearths of Hamas militants,B’Tselem (Israeli Information Center for Human Rights in the Occupied Territories), Black Flag: The legal and moral implications of the policy of attacking residential buildings in the Gaza Strip, summer 2014 (2015), pp. 37-41. then, as the ground invasion got underway, embarking on an unconstrained wrecking spree, and then, in OPE’s denouement, pulverizing four multistory landmark edifices in Gaza. 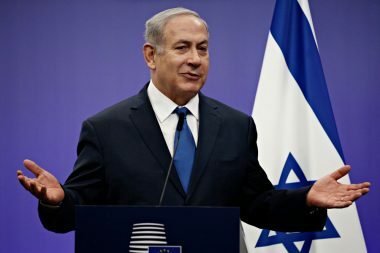 In its report, “Nothing Is Immune”: Israel’s destruction of landmark buildings in Gaza, Amnesty, although acknowledging that it was “a form of collective punishment,” brackets off Israel’s climactic act as the exception to the rule: “[T]he attacks are of great significance because they are examples of what appears to have been deliberate destruction and targeting of civilian buildings and property on a large scale, carried out without military necessity.” But the vast preponderance of Israeli destruction throughout OPE consisted of collective punishment on a lunatic scale and devoid of military purpose let alone necessity. Israel’s targeting of Hamas militants occupying or deploying from these homes amounted at most to the equivalent of statistical error. Can Amnesty possibly believe that a Hamas militant was secreted in all, or even most, of the eighteen thousand homes Israel destroyed in Gaza? Notwithstanding Amnesty’s intrepid sleuthing, 2014 Gaza Conflict (published after Amnesty’s report) points to “Omar Al-Rahim, a senior commander in Palestinian Islamic Jihad” as the actual target of this attack (paras. 267, 456). On another incongruous note, Amnesty repeatedly faults Israel for not issuing warnings before its attacks. But if the target was a Hamas militant, wouldn’t it have defeated the purpose to alert him in advance? The nebulous, subjective and relative charge of a “disproportionate” attack is much easier to rebut than the charge of an indiscriminate or intentional attack on civilians/civilian objects. 2014 Gaza Conflict repeatedly invokes the numberless caveats attached to the proportionality principle, in effect demonstrating the near impossibility of convicting anyone on its basis (paras. 49, 317-33, 401-2, 452, 456, Annex, paras. 6-8). On a related note, when Hamas fires mortar shells in a populated area, Amnesty accuses it of the non-rebuttable charge of an “indiscriminate” attack, whereas when Israel drops a 2,000 pound bomb and fires artillery shells in a densely populated area, killing large numbers of civilians, Amnesty accuses it of committing a “disproportionate” attack—an allegation that Israel is then invited to rebut (“The onus is on Israel to provide information relating to why it targeted…”). See Families under the Rubble, Al-Dali Building, Al-Louh Family Home. B’Tselem (Israeli Information Center for Human Rights in the Occupied Territories), Black Flag: The legal and moral implications of the policy of attacking residential buildings in the Gaza Strip, summer 2014 (2015), pp. 37-41. 2 Comments to "Has Amnesty International Lost Its Way? Part 5"
Amnesty International was never a fair organization. It has been politically motivated like all others. Amnesty International lost its way a long time ago, when it promoted the false baby incubator story to promote the Gulf war at the insistence of a board member who was probably an MI6 agent.